Last night Shaun and I decorated our Christmas tree and we are so happy with the outcome! I will post pics later on or tomorrow! Meanwhile, as the countdown to Christmas continues, I'm dreaming about some more great gifts that I'd love to find under the tree this year! I said it last year and I'll say it again. I love all of the Anthropologie aprons! I have one, yet it's not enough. These aprons are so pretty and frilly that they look like actual dresses! Talk about cooking in style. Since I'm all about cupcakes, and always, always, always make a mess when transporting them to the muffin tins, I'm completely smitten with this cupcake batter dispenser! What will they think of next? And while we on the subject of cupcakes, our friends Kristen and Ryan gifted me with this sweet cupcake plunger when they saw it and thought of me and my baking. How sweet and thoughtful is that? After my Dexter cupcake spackling debacle, this is the perfect way to fill those cupcakes quickly and easily! 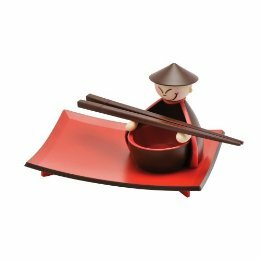 This adorable sushi set is such a fun way to enjoy sushi at home! Who needs those wooden chopsticks that break when you pull 'em apart? I'm a sucker for warm beverages, and even more so for cute vehicles for said warm beverages. I mean, can you look at these and not smile? Try it. You can't. Though I'm going to try and DIY my own this weekend, how fun are these marshmallow pops? I wish I had these for lunch today. That's it for today. What's tickling your fancy this holiday season?